Buy through MusicWeb for £10.35 postage paid. This seemingly cryptic exchange related to pastiches written for the guitar by Manuel Ponce and attributed to Weiss (among others). Kreisler had also played a number of his own compositions in concerts but attributed them to such composers as Pugnani and Vivaldi. Some three centuries earlier Johann Friedrich Fasch, was also composing music that he had presented under someone else�s name. During Fasch�s days as a law student he composed an orchestral suite and passed the work off at a Collegium Musicum session as that of Telemann. His fellow students thoroughly enjoyed the music and no one suspected his little subterfuge. He unequivocally demonstrated his own ability to compose in a style equivalent to a leader of the day. Fasch was born in Buttelstedt in 1688. He joined the court chapel of the Duke of Weissenfels as a choirboy. Here his teacher was Johann Philipp Krieger, a musician of wide culture and well versed in the Venetian, Bolognese, Neapolitan, Florentine and Roman schools; he was also acquainted with the musicians of old Bohemia. Krieger was a pupil of Pasquini and had influence of importance on the young Fasch; no less decisive was the sway of Johann Kuhnan at the Thomas-Schule in Leipzig where Fasch was to be found in 1701. In 1722 Fasch became Kapellmeister of the Court of Zerbst. Tradition has it that in that same year he refused to compete against J.S. Bach for the post of Cantor at the St. Thomas�s church of Leipzig. Bach likewise held him in high esteem as witnessed by copies of five suites by Fasch found among Bach�s manuscripts. The music of Fasch, perhaps more than that of any other baroque composer, marks the transition from baroque to rococo or early classical. His music is challenging to categorize in stylistic terms. A 1743 inventory of Zerbst�s court library boasts copies of the latest concertos by Vivaldi, Albinoni and Bonporti as well as manuscript copies of sonatas by Locatelli, Volumier and Handel. This shows how keen Fasch was to keep up to date. Although Fasch belongs time-wise to the baroque period, his lifespan paralleling that of J.S. Bach, on listening to a cross-section of his works one may wonder which member of the Bach family his music most closely resembles: J.S. Bach, baroque- inclined Wilheim Friedemann or forward-looking Carl Philipp Emanuel. More readily recognisable in his music is the emancipation of wind instruments. Also evident is the increased interest in syncopated rhythms, and chromatic inflections. His harmony tends to be richer than that of most composers of the time and without the complexities of J.S. Bach. The works of Fasch, in manuscript, are dispersed among numerous libraries throughout Europe. In addition to a quantity of concertos, overtures, sonatas and symphonies he is credited with at least one Passion, fourteen masses, two credos, four psalms, some one hundred church cantatas, four serenades and four operas. Despite his prodigious output there is a general paucity of recorded music by Fasch. Even the prolific Naxos has only managed two inclusions in their discography for this composer. The review disc from Capriccio presents five Fasch concerti. They offer an overview of his instrumental music. Particularly significant is the �Concerto a due cori in B flat� [1-6]. This is an instrumental suite on a grand design. With its attractive mixed arrangement for contrasted winds and strings (a due cori) it fits the type of �Concert overture� that Johann Adolph Scheibe refers to in his �Critical Musician� (Leipzig 1745). The programme on the review disc is well chosen and exemplifies the aforementioned characteristics of Fasch�s composing style: rich harmonies, conspicuous wind instruments and syncopated rhythms. This is beautiful music that satiates the human ear�s innate harmonic affinities. Overall the performance is very good but does not supplant that of the English Concert with Trevor Pinnock, a 1995 recording also of five concerti by the same composer (Archive 449 210-2), which in all aspects is quite outstanding. 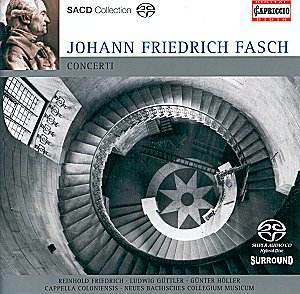 Capriccio�s new release of concerti by Johann Friedrich Fasch is recommended listening. It is, however, not the best available recorded example of this important and under-recorded baroque composer.